Lori, a Senior Tellington TTouchÂ® practitioner and Kathy, a Certified Applied Animal Behaviorist, share a deep love for senior dogs. Theyâ€™ve combined their decades of animal-care expertise to teach this custom-designed workshop which welcomed as participants a small group of senior dogs and their caregivers. 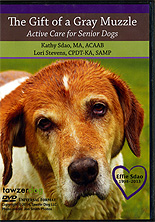 Lori and Kathyâ€™s goal is to empower you to joyfully and actively engage with and support your aging dog. Watch these experienced professionals share several methods to keep your dog's mind and body agile and strong. They also discuss many ideas for making everyday life easier for your senior dog. The result is a dog who is more competent and confident in the face of physical and cognitive challenges and who has additional opportunities for staying healthy.